Poor, Poor Ophelia by Carolyn Weston – mystery novel. Police procedural that was the inspiration for the television series Streets of San Francisco. I read a Friday Forgotten Book review of it and bought it. To be read soon. The Risen Empire by Scotto Westerfield – 2003 science fiction novel, first in The Succession series. The second novel, The Killing of Worlds was published later in the same year. Though there have been no further books in the series, I thought I’d try this. It has 341 pages of small print and narrow margins. The Living Shadow by Maxwell Grant [Pyramid 1974 paperback, purchased used] – mystery adventure. A Friday, May 7, 2010 post by Evan Lewis at the Davy Crockett’s Almanac blog first brought this to my attention, and a recent mention of it somewhere else reminded me and I found a copy. Should be fun. The Paper Magician by Charlie Holmberg [47North 2014 ebook] – fantasy, first in series. I read a review of this on SF Signal and decided to try it. Realms 2 and Clarkesworld Year 3, 4, 5, 6 edited by Neil Clarke & Sean Wallace [Wyrm Publishing, 2013, 2014 trade paper, purchased new] – science fiction short story collections, the stories from the six years of Clarkesworld magazine monthly issues. Neil Clarke should be a hero to any reader who enjoys short science fiction. Each month some of the best writing in the field is published in Clarkesworld, between covers displaying some of the best cover art in the business. I decided to buy these print collections to catch up as I don’t read the magazine in e-format. I also have Realms 1 on order but it has yet to arrive. 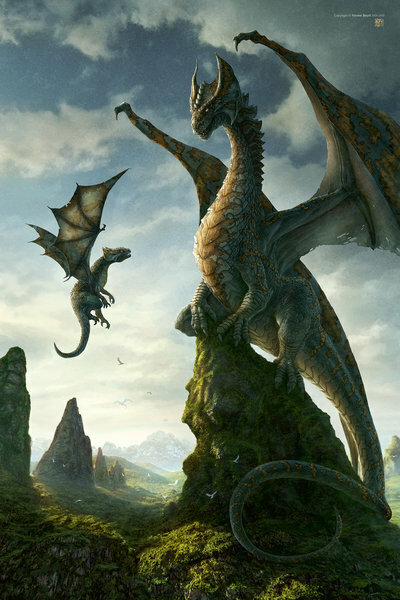 I also picked up this print of a mother and baby dragon titled “First Lesson” by Kerem Beyit, a Turkish digital illustrator. Beyit’s work can be viewed on the Deviant Art website here. The print is 12″ x 18″ and shows the baby dragon trying it’s wings for the first time. I love it. It’s at the frame shop now, and when it comes back I’ll have the happy job of deciding where to hang it. This entry was posted in art and illustration, mystery, New Arrivals, Pulp, science fiction. Bookmark the permalink. Love the dragon print! I have that Shadow paperback. I think you’ll like THE RISEN EMPIRE. I wish Scott Westerfeld would write more books set in that universe. Charles, thanks for your opinion, when it comes to SF-F you know your stuff. George, I like to buy a print now and then, though I’ve run out of places to put them. I am taking most of the books I bought back to the library. Just can’t see mailing them home. Patti, oh my. I guess once I had them in hand, I’d send them the cheapest way possible and then decide later, when I opened the box. Did you have a chance to read any of them? Love the print. I had that Shadow book, signed by Maxwell Grant/Walter B. Gibson at a long-ago Bouchercon. The Westerfeld is already on my list for when we get home. I’very liked all of his stuff that I’very read. Jeff, I’ll bet you’ve already read that Westerfield. That Shadow book, signed. Wonder where that copy is now? I’m sure that Bouchercon was before I even knew there was such a thing as a mystery convention. By the way, while we were downtown today dropping off our taxes, we went by the convention hotel for this year’s Left Coast Crime, Crimelandia, the Marriott Doubletree. Looks like it will be a nice venue. When did you say you’d be flying in? The first few Shadow novels, when he was still a mysterious figure of the night, are by far the best. If you like this one, the next few are available for your borrowing pleasure. The downtown Marriott is nice, but isn’t Left Coast Crime at the Lloyd Center Doubletree? Although we have a few public and institutional libraries that only a few visit, I miss the active library circuit including sales of books to be discarded. Evan, oops, yes the Doubletree, which is where we dropped by. My mistake. I’ll fix my comment. Prashant, we didn’t use the library that much until we moved to Portland, the system is so much better here, we have cards in the three counties around us and can get most things we want. Whoa, that cover for Poor, Poor Ophelia is wicked. Poor Ophelia indeed! I like the print, I can see why you wanted to bring a copy home. You’ll have to send me a picture when its hung. I recently got my Whelan print framed and now I’m contemplating finally pulling the trigger on a Les Edwards print of a science fiction image that I’ve loved for YEARS. I would like to get it, get it framed, and put it in my office. I just got a work bonus and am thinking I might use that to get it for myself for a gift. Carl, heck, now I want to see that image. How about a link? Will do on that photo request. I am envious of your treasure trove. But to take the sting off of my envy, my mailbox contained 3 new books from my editor at Mystery Scene, so the day still has been a good one (so far). And, BTW, now that I have discovered your wonderful blog, I shall return.